Hi! Tomorrow is the last day of term for my children so I thought that I would share a couple of the cards that I have made for one of their teachers and teaching assistants. As you can see, they’re the same design apart from the ‘Best Teacher’ banner on the first card! Supplies used: Memento ink – Lady Bug, Cottage Ivy and Tuxedo Black. Lawn Fawn – Lets Polka in the Dark papers, Lawn Fawn Stitched Circle Die and Stripy Backdrop Die. Spellbinders Circle and Banner Die, Clearly Besotted Banner Die and all stamps Clearly Besotted. Kraft and white card. Although I’m glad that the summer hols are here for the kids, this year there is a tinge of sadness as my daughter will leaving this school and will be going up to ‘big school’! As this is a scheduled post that I’m writing a week in advance I can say that tomorrow and Thursday will be spent at her new school. Everything is crossed that she likes it but I also know that it’s the start of another exciting chapter in her life. It’s a great idea to make two cards in similar designs, small changes make a big difference. 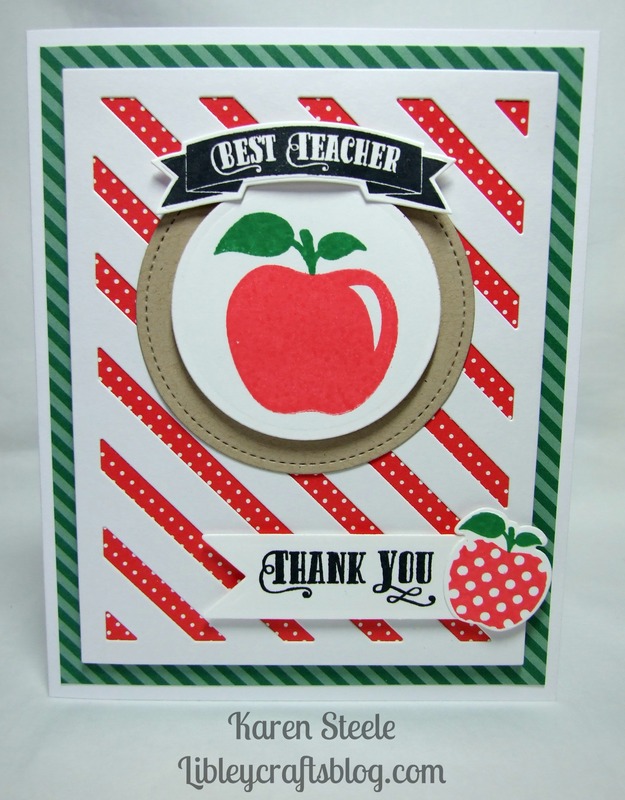 Love the effect of the dots and stripes together and the designs are fit for teachers’ thank you cards. Beautiful. So professional! I still need to get myself that background die. Hope all went smoothly with the change of school! Thank you Gillian! Today was the leavers service. All the leavers had to talk about their favourite memories, teachers talked about theirs and there were some lovely songs with very moving words – it was during the first song that I started blubbing and have carried on like that for the rest of the afternoon! Dreading what I’ll be like tomorrow! So far, daughter has been absolutely fine! Maybe today will have been the worst of it for you, and you might be able to enjoy tomorrow more? Usually the dreading of something is worse than the event itself. It’s great that your daughter is fine, and I expect parenting helped! But if you are a blubbing wreck, so what?? Lovely cards, really cheerful! Hope your daughter settles in all right…I cried when my son left for his first day at college! Sweet! I come from a family of teachers and I can promise you they will love it!! Awesome teacher cards, Karen! Love the fun mix of dots & stripes! FAB teacher card, Karen !